How do you use Participatory Budgeting (PB) to inspire co-productive ways of working? And how do you engage in rural or urban locations and create commitment within a diverse and changing population? Join and be part of a debate on PB and co-production. In 2017 Shared Future facilitated a citizen led inquiry into Health and Wellbeing in Central Blackpool. These short videos, taken on the 4th May 2017 explain the reasons behind why the inquiry was needed and what went on. The interviews were filmed by Martin Wells of HeadHandHeart Ltd.
An entertaining explanation of community shares and how they are used to support social enterprise. Shared Future has been coordinating the NLSE network since 2009, and arranged the making of a short film about the organisation’s 2010 festival. Watch a video of a Participatory Budgeting (PB) event held in Blaenau Gwent. 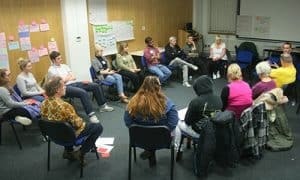 Shared Future supported The Well to set themselves up in 2012 as part of Lattice Work, including initial one-to-one advice and training for their volunteers.